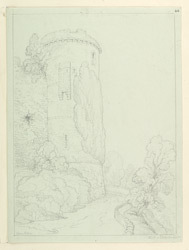 Drawing of a round tower of Usk Castle in Monmouthshire (now in the county of Gwent). This was originally a castle of earthworks, built around 1138 by the de Clare family. During the reign of Henry II the first stone castle was built. However in the 13th and 14th century, considerable improvements were made. In c.1403-4 the castle was besieged and heavily damaged by Owain Glyndwr. This is the west or Garrison Tower, so-called because its function was to accommodate soldiers. It still stands today.